Cable cars are modern means of transport that use cables or wires to transport both goods and people. But ancient paintings found in caves of China show that people have been using ropes or cables to travel or transport goods starting 250 BC. Particularly after the availability of steel cables after 1834, the cable car became a regular means of transport and it has since seen continuous global expansion. Over 30,000 cable cars built by different companies are in operation right now around the world. Today cable cars are helping tens of thousands of people to travel fast and safely. With increasing urbanization, the number of vehicles in mega cities is increasing and so are accidents. Kathmandu and New Delhi are already among the most polluted cities in Asia. And getting stuck in traffic jams for hours has become a routine affair for city-dwellers. One reason behind these jams is that our roads are narrower compared to the roads of other international cities. Only a few roads in Patan and Kathmandu have been developed into two, three or four lanes. Considering this, the Ministry of Infrastructure and Transport has already commissioned a feasibility study on a metro rail system in Kathmandu, at an expenditure of Rs 70 million. Meanwhile, the ministry is preparing another feasibility study on metro and monorail systems in Kathmandu. A study five years ago had estimated the cost of a metro rail in Kathmandu at around Rs 330 billion. Today, the range will be around Rs 450 to Rs 500 billion. Therefore, metro and mono rails are not feasible, considering our government’s limited financing capacity and as limited technical expertise. The country’s small economy, people’s low purchasing power and heavy investment requirements make metro rail unattractive for foreign investors. There are other limiting factors. Kathmandu was a big lake 10,000 years ago. The lake dried up to leave fertile alluvial soil on top. Geologists also claim that the ground beneath Kathmandu is semi-liquid and made of water, sands and weak soil. Therefore building deep foundation for metro or mono rail is almost impossible here. But as we can also see traffic in the narrow roads of Kathmandu has gone haywire while laying Melamchi pipes. A metro system will involve 10-40 times more digging as compared to similar work on Melamchi project. Structures for mono rail might be less complex compared to metro rail. However, it will not be easy to build big pillars for it in the narrow roads of Kathmandu. Traffic may be halted for months, even years, to lay concrete bridges on the pillars over our narrow roads. Also, acquiring private land for such a mega project will be prohibitively expensive. Cost of such mono rail is estimated at somewhere above Rs 6 billion. Some monorail projects in other countries have been stopped halfway and existing mono rail projects have been shut down. Line 1 of the Mumbai’s mono rail project was started in 2009 and was completed in 2014, after five deadline extensions, and at a whopping cost of IRs 2.4 billion. The local government has since decided not to build any other mono rails, which have been deemed both costly and highly complex. Another mono rail built in Sydney in 1998 was shut down in 2013. Mono rail projects also require building of stations, which requires a large space. Kathmandu valley has an estimated 4 to 5 million people but feasibility studies suggest few people in Kathmandu are expected to take metro or mono rail for their daily commute as a large section of people in Kathmandu is still engaged in agriculture and household chores. This will lead to low utilization of either metro or mono rail systems. On the other hand, a cable car system can carry 2,500 to 3,000 people every hour and suits the needs of today’s Kathmandu. This will also help ease current traffics, particularly from buses, micro buses and tempos. 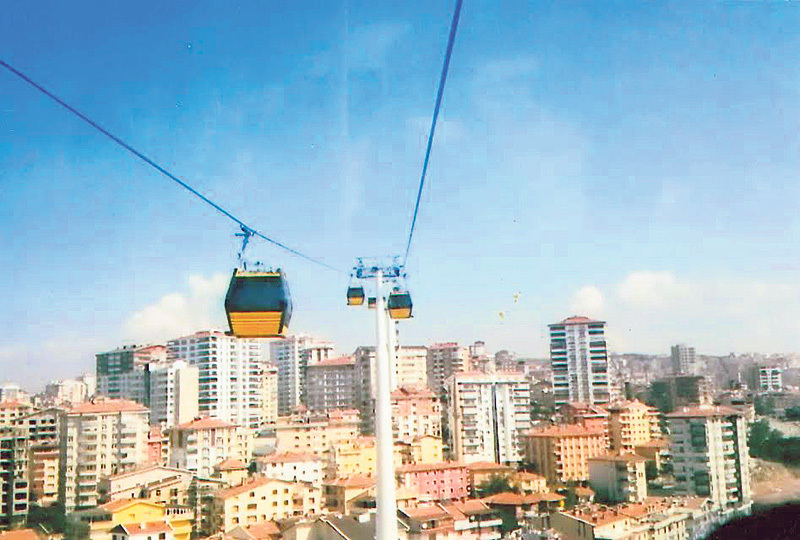 Cable cars built in cities like Ankara, Caracas, Bogotá, Medellin, La Paz, Mexico City and Lima now not only transport a great number of people but also boost local tourism. People have saved 30 to 40 percent of their traveling time and air and noise pollution has also been cut in these cities. Cable cars are also cheaper to build, costing Rs 1.5 billion to Rs 2 billion per kilometer. A cable car system in Kathmandu will increase people’s mobility, reduce travel time, ease traffic congestion and minimize air pollution. There will also be fewer concrete structures compared to mono rail and metro systems. It also can help promote tourism as tourists can use cable cars for sightseeing. Therefore, it is high time that we started using the sky to travel in the city, considering the sorry state of our roads. Interestingly, the French government had appointed a team of experts to conduct a feasibility study on a cable car system for Kathmandu and Patan. 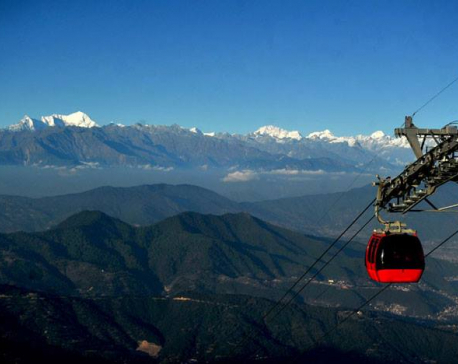 The team’s final report indicates that a cable car system in Kathmandu and Patan is feasible. So what are we waiting for?